Every year has an ebb and flow – a different type of energy – and the last day always has a different feel. The students this year have been as united, as cooperative, and as much a joy to be with as any of our best past experiences. I am sure it does not always feel to them as if we see it that way – but I did try to explain we are like parents – we appreciate them, just not all of their decisions. So please know they have been great travel partners. After a little breakfast we were fully loaded with all suitcases on the bus by 7:50 a.m. (so, after 10 days I can tell you every student can get to school by 8:20 a.m. – no more late arrivals please as we know they can do it…with some support!). First stop, the Knesset. No, Bibi was not there to greet us but Barak explained a bit about the huge Menorah at the site – can anyone say, photo op? From there we traveled to the Old City of Jerusalem. Is there a more special place than the Old City of Jerusalem? That, by the way, is my definition of a rhetorical question. Barak talked to us of King David (I wonder what made him think of that?). We then meandered, with intention, through back alleys and rooftops to a gorgeous site with spectacular views (more photo ops!). 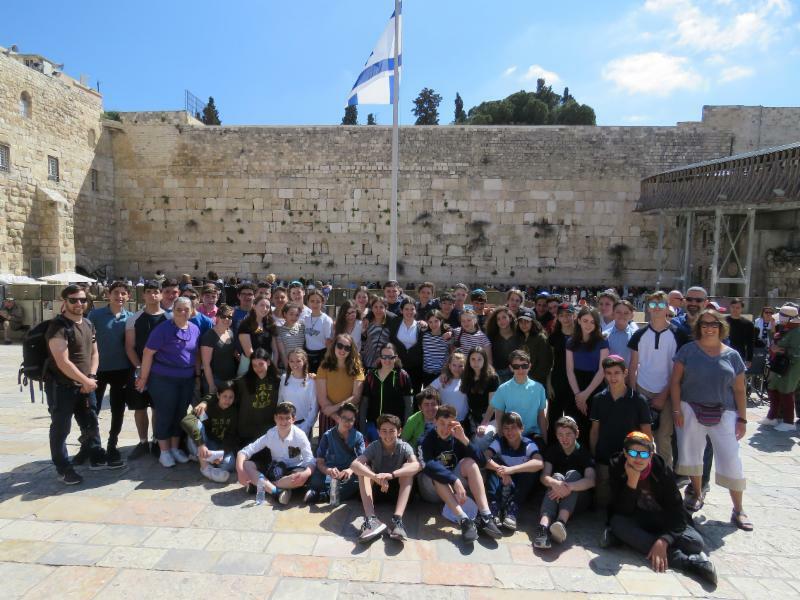 Here we heard more stories and we talked of the meaning of the Old City and the Kotel to Jews – because soon it would be time to go visit. He also told us a story – why Jew-ish? One is not Christian-ish or Bhuddist-ish? I am not sure I understood the point of the story but somehow it fit the "they tried to kill us, we survived, let’s eat" narrative that runs through our history-ish. Before heading to the Kotel we needed energy – so we celebrated our third birthday with ice-cream (I am going to say that it is possible that buying ice cream in the Old City was not the wisest choice financially – but the kids are worth it – especially with the kind birthday boy parent support we had). So once fueled it was time to talk about the Kotel again – last minute notes were written (most already had their notes complete) and we headed through security to the open square in front of the wall. At the Israeli Flag in front of the wall we gathered together for final instructions (you got it – photo op!). Then we separated and went off for our alone time with this sacred place. Many of the young men with me chose to lay tefillin and pray while others just felt the power and peace of the Western Wall. 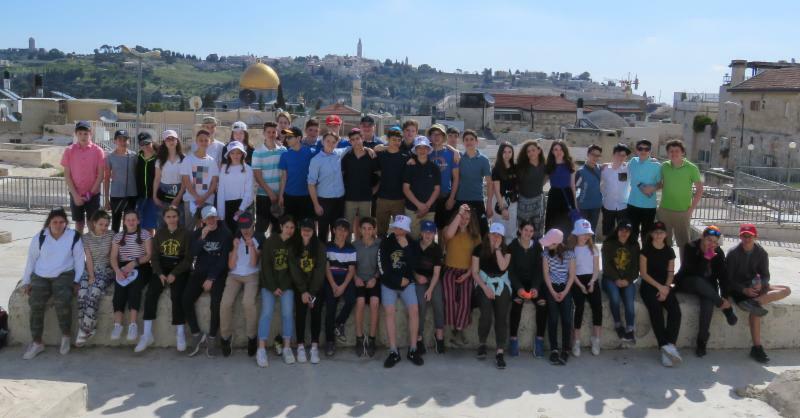 One thing I had never seen before is that they were removing the notes from a section of the Wall – a little Pesach cleaning no doubt – there were cameras and news stations covering this moment which added a new dimension to the visit. And with that we made our way back to our bus for the hour or so journey to Tel Aviv where we arrived at the Carmel Market at 12:30 p.m. 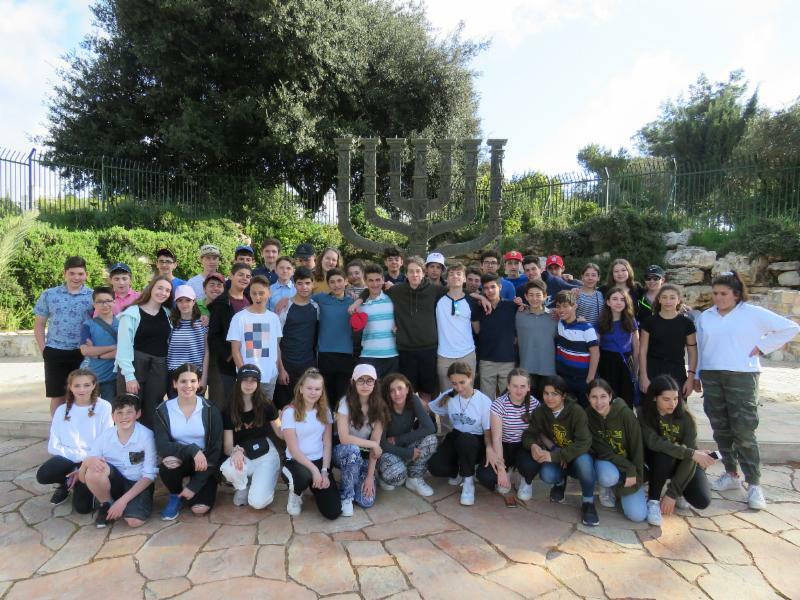 Here, Barak, Mr. Dichter and Ms. Neuman organized the students into groups, gave them firm and clear instructions and some lunch money and sent them off to explore. My first stop was with Debbie and Miss Lane for shwarama – I love this country! Then we meandered the market finding students everywhere either eating or negotiating on everything from clothing to candy (can’t have enough snacks for the flight home). After an hour at the market all students appeared as requested and we headed off to find the bus – not as easy as you might think in the busy Tel Aviv chaos where cars, motorbikes, busses, bikes, both electric and human-powered, electric scooters and pedestrians all fill the crowded and narrow roads and seem to edge in whichever direction they feel as the mood strikes. Mission accomplished we were on the bus for our 20 minute drive to the Palmach Museum. The Palmach Museum tells the story of this army from before Israel’s Independence to after the conversion of this group to the present day IDF. Students went through the interactive museum in two groups – they have a limit per group size so I had to give up my spot and wait patiently, with an another ice coffee – you have no idea of the sacrifices I make for your children! After the museum we drove by the beautiful beaches in Tel Aviv on our way to Yafo – and we stopped so the students could get out and feel the ocean breeze. At Yafo we went to a gorgeous lookout – where the oceanview was stunning – the Mediterranean is so gorgeous! By now it was close to 6 p.m. and we headed across town to a the Bnei Dan Hostel – it was a new location for us (if my vote counts, first and last time). Twenty-four students were being picked up at 6:30 p.m. so it was a definite ‘balagan’ as we tried to check 26 students in while sending 24 students on their way. Thankfully we thrive in chaos – your children have taught us well. We also had a lovely visit with more alumni – Igal and Johnny Raich, Eli Friedland and Noa Platner. We so appreciate their taking time to come and say hi. After dinner at 7:45 p.m. we headed over to the Port for an hour so the kids could stretch their legs and have some fun – have ice cream and enjoy more of the ocean air. By 9:15 p.m. we were back at the hostel and with lights out and wake-up times organized we were ready for our morning 7:45 a.m. journey to the airport. As our trip comes to an end (we are looking for a kickback from the Israel Ministry of Tourism as 26 of our 50 students are remaining in Israel and joining family) all of the chaperones would like to give a shout out to all of you – our parents – we have never had a group of parents who allowed their children to handle their experience as much as this group. We appreciate the faith you showed in your children and the trust you placed in us. It is not an easy trip for anyone – lack of space and privacy, new experiences and new people, different food and jet lag – no shortage of anxiety producing moments and your children have been exemplary – even in the moments where we might have caught their attention. Awesome – they have earned a break. A few final words of gratitude – much of what I have shared in the past because the thanks are the same and as sincere. I would really like to recognize the Jewish Federation of Greater Vancouver and the Gesher Chai Committee – without their financial and logistical support this trip would be virtually impossible for us to share with our students (and the JFGV helped more by providing support to families requiring additional financial assistance). In addition, I want to acknowledge the Betty Averbach Foundation who also help by providing additional financial support to our students for this trip. Also none of this happens without the incredible work and care of Dorin Eilon-Heiber who organized the mifgash on our behalf. Dorin has been ably assisted on this trip by our trip leaders, Matt Dichter and Corin Neuman – quite frankly Dorin and I often looked at each other over coffee feeling proud at what a great job these two ‘thirty-somethings’ were doing – it is a phenomenally stressful position and they handled it with care for all. We also could not do this trip without our extra support. Lu Winters, Julie Lane, and Debbie Appelbaum were outstanding – smiles on their faces all of the time, taking kids aside, organizing, participating and helping everyone have a great time. It is quite an ask for staff to leave home and their families for so many days – and they each do it with pleasure to support our children. I also want to thank Alex Monchamp – Mr. Mo and the King David staff – for keeping King David running smoothly in my absence – as always they demonstrate that I really should take more holidays! Israel to Toronto – Air Canada 85 departs at 11:45 a.m.
Toronto to Vancouver – Air Canada 33 leaves at 8:15 p.m. and arrives in Vancouver at 10:05 p.m. Please be there, on time, to pick up your children.